Each open field was divided into a number of furlongs of different sizes; each furlong was divided into holdings or strips which were allocated to tenants or farmed directly by the lord of the manor (as demesne0 or owned by freeholders. Furlongs are listed by open field and in a numerical order. The introductory paragraph seems to suggest the furlong number might have been physically present at the headland of the furlong, or is this too fanciful an interpretation of “According to such numbers as on their heads appeareth”? Alternatively, this may be a reference to notation on a map no longer extant. Only some 56% furlongs are named. Many (63%) have a text description giving its location in relation to (some) other furlongs. The rest are named but give no location information. Almost every furlong has a note giving the cardinal point from which the surveyor began; we assume it would have been most practical for him to have walked across the strips, so that the direction of the strips would have been perpendicular to the direction of walking, enabling him to count and number the lands as he progressed. In practice, as is shown later, this did not always seem necessarily to be the case. The sequence of furlong numbers does not seem wholly to follow a numerical order on the ground, although on our assumed disposition some groups of adjacent furlongs do follow a numerical sequence. It is not possible to so arrange the furlongs as to completely follow a numerical sequence and satisfy the location information. We do not know if the numbers were allocated by the surveyor or were already in use – in which case they may have indicated the order in which they were developed. The list does not give areas of furlongs, which we have calculated as the sum of areas of the holdings for the furlong, assuming freehold holdings measured the average of the tenanted ones. The survey has 104 pages listing each of the 4177 separate holdings for each of the 117 furlongs, grouped by open field. We assume this was in physical order. 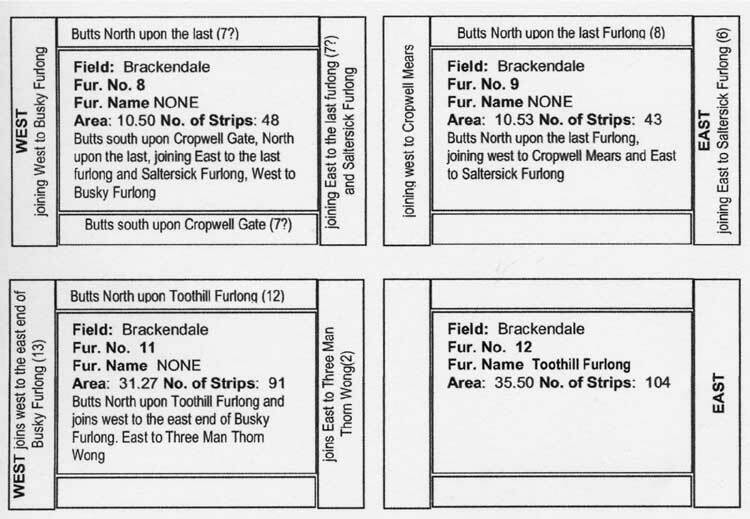 The list gives the name of the occupier(s), tenure (freehold, tenant, demesne or glebe), number of strips in this holding (frequently there is more than one strip to a holding . The area used for arable, meadow and pasture is given for each except freehold. The area of freehold holdings is presumably omitted as these were not owned by the estate and would not form part of the valuation for which purpose the survey was produced. The description also indicates where a land is actually divided (across its length) into two holdings, with a comment such as “at the north part of the next strip”. The survey was not accompanied by a map – or at least, one is not extant. Thus we have attempted to reconstruct such a map using the textual information and trying to marry it with the (later) maps at our disposal. Calculate the expected area of the furlong, i.e. the sum of the total areas of the holdings within it. As no freehold areas are given, it seemed logical to use the average area of the tenanted holdings for that furlong as the area of a freehold holding. It is likely that in some circumstances this would introduce small errors that helped prevent meeting some boundaries. We do not know whether or not these measurements excluded access tracks. Subsequently, we refer to this as the ‘expected area’. But this does not cover every eventuality. Butting implies continuity of direction, joineth might imply joining at right angles, the missing definition is where there are two furlongs with holdings running side by side - is this butting or joining? A case can be made for both! We are not sure of the significance of the furlong numbers. Do they indicate a possible order of survey, and therefore the layout needs in some way to be sequential? The layouts that we achieved have chains of sequentially numbered furlongs, and then the chain is broken. Might this indicate a day’s work for the surveyor and that he did not necessarily start the next day where he left off? Or might it relate to a pre-existing numbering system? Lay out the cards to reflect the joining information as much as possible to produce a likely spatial disposition, jig-saw-puzzle style. Additional information helped, such as if a furlong referred to a known (or assumed) road (gate) or some other feature (e.g. “abuts north upon the town”, “buts south onto Cropwell Gate”). Produce strips of paper of a standard width (=220 yards) to represent each furlong scaled to its estimated area. Using the layout produced at 3, place the strips on a paper map in the approximate positions relative to map features and the surveyor’s direction of walking. Where necessary a long strip might be cut in two to produce a ‘squarer’ shape. Using the layout in 4 as a guide, produce a polygon for each furlong on the GIS of approximately the expected area following available boundaries using the hierarchy of choices described in part 2. In an attempt to make the areas as ‘accurate’ as possible, we then manipulated the furlong boundaries with respect to map features but not slavishly so. Usually we managed accuracy better than ± 10% but occasionally worse! Test the draft layout against the map of ridge and furrow. Trent and Peak Archaeology suggests these may be 14th century or earlier in origin, but they must nevertheless be a consideration. Test the draft layout of furlongs against the map of hedgerows suggested by a previous BHTA survey to be dateable to Tudor or pre 1776 enclosure times. Whilst enclosure boundaries would not necessarily closely follow furlong boundaries, there might be a correspondence where the lines are reasonably adjacent, particularly where there are identifiable sinuous boundaries that could have followed the “S” shape of strips often noted in the literature. Test the resulting shapes of furlongs and widths of holdings against the 1614 map of East Bridgford for any signs of congruence. With experience it became possible to use the GIS to rearrange furlong polygons when editing to ‘improve’ the layout. The resulting conjectural map of the open fields of Bingham is at figure 5. Surprisingly perhaps a number of holdings were meadow or pasture rather than arable. Table 1 gives the proportions. Whilst most of our reconstructed furlongs obey the norm mentioned by other authors (eg Orwin and Orwin) of being long and narrow, some do not. Our plea is that there are similarly ‘misshapen’ furlongs at East Bridgford, 2 miles to the north of Bingham, that could be taken as a model in these and other circumstances.